There is a successful treatment for brown patches on the face, also known as melasma. Here at Denver Laser Solutions we skillfully turn to intense pulse light Photofacial. When used properly IPL photofacial can help clear the more superficial darker layers of pigment from melasma, while our TCA peels combined with skin bleaching ingredients are used following IPL to treat the harder to reach pigment in the dermis. What are the brown patches on my face? 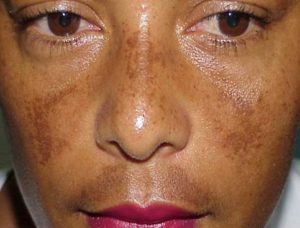 The proper name for them is Melasma, a staining on the skin that resembles severe sun damage or a large birthmark. Hormonal fluctuations in the body such as contraceptive pills and pregnancy may be to blame, hence the nickname “pregnancy mask”. This intrinsic form of skin pigment lies deep in the lower layers of the skin making it more challenging to clear. We can discern that your pigment irregularities are hormone relate opposed to sun damage due to the large patch-like appearance that tends to mirror itself on both the left and right sides of the face. It is important to note that Melasma is a chronic skin condition that may never fully go away and may need to be retreated annually to be kept at bay. Melasma treatment creams, such as Hydroquinone and Retin-A, along with sunscreen play a large role in continued successful results. *Stop by our office and pick up DLS Skincare HQRA, a prescription product we carry and highly recommend to help treat Melasma. TCA Peels are similar to MicroPeels, but stronger. The TCA peel used for treating Melasma is a custom blended treatment that includes skin bleaching ingredients which are driven deep into the skin to offer more support for lightening dark patches and removing or reducing lines and wrinkles. Combine 1 full face photofacial treatment with 2 TCA peels for a 10% package discount. Combine 2 full face photofacial treatment with 4 TCA peels for a 20% package discount. Melasma can also go by the definition of “pregnancy mask,” this hormonal-induced dark patch like stain in the skin usually occurs on the face, sometimes just on the upper lip, or on the cheeks, temples, or forehead. This dark pigment is different from sun spots or freckles because it’s pigment travels deep within the skin layers making it easier to reoccur and more challenging to treat. And unlike sunspots melasma is caused by hormonal imbalances such as pregnancy, menopause, birth control, medicines, or vitamins. Although there is no cure for melasma, this skin condition can be effectively managed. Any recommended at home melasma treatments? Absolutely, melasma home remedies are most definitely suggested to help assist in achieving great result. Although, most home extremities that you find over the counter are much better at helping you maintain improvements achieved from professional treatment rather than actually producing the effect you are really looking for. At home remedies include daily application of skin lightening ingredients and sunscreen. How does Denver Laser treat melasma? Although treatments for different skin types are recommended (see FAQ “Are there any side effects of melasma treatment?”) Generally an excellent candidate for Denver melasma treatment goes as follows: Prior to starting any home remedies such as lightening creams, an IPL Photofacialtreatment ifor melasma s the first line of defense to remove the most superficial layers of pigment. Following the laser melasma treatment you will be asked to start daily application of a prescription grade hydroquinone cream or natural skin lightening agents these creams will help maintain the benefits from your IPL treatment and also penetrate deep into the skin to start targeting the stain in the dermal layers. Two weeks following your IPL session we recommend a series of 1-3 TCA chemical peels for treatment of melasma in the dermal layers of skin. Throughout the treatment course you need to be very cautious in the sun and protect yourself from additional heat such as vigorous excessive exercise, steam rooms, saunas, or hot yoga as any type of heat not just the sun can contribute to the re-occurrence of melasma. What is the difference between rosacea and melasma? Very simple, rosacea is the accumulation of excessive broken blood vessels predominantly in the cheeks, nose and chin where as melasma is hyperpigmntation or tanning of the skin due to overproduction of melanocytes. Do treatments for melasma hurt? Photofacial is a light based treatment which sensation feels akin to a rubber band snap, the application of topical numbing cream and taking two Ibuprofen approximately 45 minutes prior to your treatment make it extremely tolerable. TCA peels, on the other hand, are a completely different sensation. This chemical peel is applied in layers, with each layer applied your skin will feel very warm with a tingling sensation. Approximately 5-10 minutes following the last application of TCA peel your skins PH balance will begin to neutralize and those tingly sensations will be gone. Any side effects to melasma treatments? The risk when treating melasma is that it could get worse. Darker skin types such as Asian, Hispanic and African American are more resistant to treatment and are at greater risk if not treated properly, particularly with laser treatments. Darker skin tones quickly absorb heat produced from the laser which can “act like the sun” and create an even darker tanning of the melasma patches. In addition, the technology and creams used to treat melasma also cause sun sensitivity meaning that you can burn much easier while in the sun therefore if the client is not properly educated to use extra sun protection then melasma can get worse.